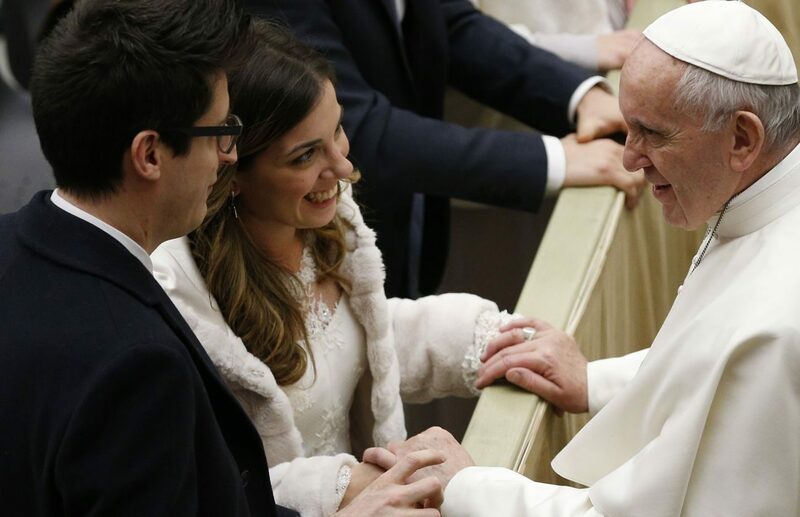 VATICAN CITY (CNS) — Each week dozens of newlyweds, dressed again in their wedding gowns and tuxedoes, come to the Vatican to receive a special papal blessing as they begin their lives together. “It’s always been a dream of mine, since I was little, to come to the audience and see the Holy Father and see the newlywed couples. It’s always been a very special way to celebrate a marriage,” newlywed Kelly Michelle Byrne told Catholic News Service. Couples from around the world who have celebrated their wedding recently are given special “sposi novelli,” that is, “newlywed,” tickets to the audience and are seated in the VIP section. “Personally, I’m very positive on his messages about integration and thinking of other people. Everything he says is useful advice for marriage,” he told CNS Feb. 8. “A marriage without the help of God cannot go forward; we must ask for it every day,” the pope said. Pope Francis “is very close to young people just like St. John Paul II was. When he speaks, it’s in a simple manner that everyone understands. Today, he encouraged us to always ask for the Lord’s help,” said Marco Damiani. Catholic marriage is important “because there is a strength that is given to us. Doing it alone through your own strength isn’t enough; you won’t be able to go anywhere. It’s like having another” helping hand, Stefania said. “We asked him to bless us and the new child we are expecting, and he wanted to know when the baby will be born. We told him in September and then he gave us his blessing,” Marco said. Stefania added that Pope Francis also “told us to dream about the baby first,” advice that ties into an image the pope often uses to describe how God cares for his children. “We, each one of us, has been dreamed of by (God) like a father and a mother dream of the child they are expecting. And this gives us great reassurance,” the pope said Oct. 13, 2016. Catholic newlyweds aren’t the only ones hoping to receive some encouraging words from the pope. “It was very important for my religious belief that I meet the pope and receive his blessing. I would be really amazed if I get that,” Camilla said before heading into the audience hall and having her wish come true.